TTC staff presented a Bus Fleet Plan at the May Commission meeting as part of a general overview of the fleet situation. This brings to the foreground important issues that are part of the TTC’s and the City’s budget planning process. 1. What Ridership Should We Plan For? TTC ridership planning has assumed a growth rate of about 1.2 percent based on long-term historical trends. However, the period in question includes the post 9/11 and SARS ridership dip. The system has now recovered and surpassed year 2001 with 436-million rides in 2005. The rate of growth since 2003 stands at 3 percent. The question planners face is whether this will be sustained over the long term, drop back to the long-term pattern, or grow at an even faster rate. Here is the chart illustrating the magnitude of the problem. Projecting the 1995-2005 data gives us a 1.2% growth rate and a target ridership of 488-million by 2015. This is less than ten percent over 1990 levels and would be a dismal showing for 25 years of supposedly pro-transit policies in Toronto. Projecting the recent 2003-2005 trend out to 2015 gives a target ridership of 569-million by 2015. This is more respectable, but still only about one percent per year if we use 1990 as the starting point, and nowhere near the rate of growth of the city’s population. Where will the growth occur? In the suburbs where there is a low transit modal split and hence a greater potential demand? Only on major corridors where transit service competes well with automobiles? When will it occur? Over half of the TTC’s riding is during the offpeak when there is much room for growth without additional infrastructure or vehicles. Will offpeak riding go up disproportionately if and when service quality during that period improves? What will be the effect on various modes and major routes? Will the impact fall more heavily on the bus fleet, the streetcar/LRV fleet or the subway? Do plans for significant network additions address overall growth at a high rate? 2. What Is The Outlook For The Bus Fleet? 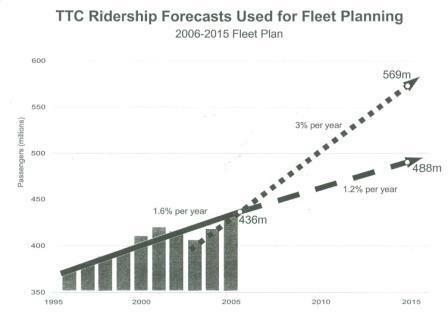 TTC staff presented a projection of fleet requirements depending on which ridership estimate we use. The line “Additional buses for contingency” addresses a serious problem with the fleet today. The TTC does not have enough buses to handle current service demands especially with the unplanned need for diversions around two major road collapses. Staff reported that about 20 scheduled buses are cancelled because there is not enough equipment. The “contingency” consists of 25 buses over and above service and maintenance requirements. From the chart, you can see that the higher growth rate leads to a need for over 300 new buses in addition to requirements already on the books for fleet replacement and modest growth, and the new provision for contingency buses. This will have a profound effect on not just the capital budget (two new bus garages over and above current plans), but also on the operating budget. Few if any of the additional riders will be carried at a profit, and operating deficits will increase faster than inflation as service expands to handle the demand. We have gone from a situation where plans to attract additional riding have been overtaken by events. This may sound like good news and may even give comfort to those who downplayed the RGS as a waste of time. They should not be smug. 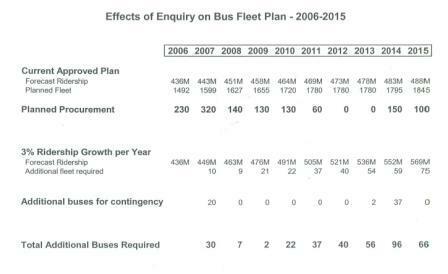 Note that the additional bus requirements in the first few years are low. The reason for this is that the 100 “Ridership Growth Strategy” buses provide a cushion when they arrive later in 2006. This extra order, which took so much effort to get through the bean counters on City Council, is the only thing saving the bus network from total overload in the next few years. The challenge for the TTC and its allies at Council will be to get this and related plans such as the new streetcar purchase through the Budget Advisory and Policy & Finance Committees and then on to Council. As a city, we must accept that “Building a Transit City” is not free, and we will face rising costs to provide more and better service. The alternative is to strangle in our own traffic chaos. I will save further editorial thoughts for another post.